And so, with that in mind, we have begun to distance ourselves from a system that says “everything church-related happens in this building.” We’ve stopped facilitating and participating in so many scheduled programs that revolve around a certain building labeled the “church.” And instead, we've started adding much more time spent with people at our home, outreach events in our community, and evenings out with friends. I understand people’s confusion about why we would be a part of a community that doesn’t meet every week, because that is what they consider “church” to be. This process of understanding that people are the church, rather than a place or a building, has been a bit of a struggle for me as well. But I believe if we want to truly love people well—love them the way Jesus did—we have to leave room for people who are far from God to talk about the hurt they’ve been through, the wariness they have about Christians, even the anger they may hold against the church in settings where they feel comfortable. We have to be willing to listen without getting defensive, without arguing or feeling like we need to defend God. To really hear what others are saying. We have to be willing to have these conversations in places other than just at "church." And this is why I’ve stopped inviting people to church. 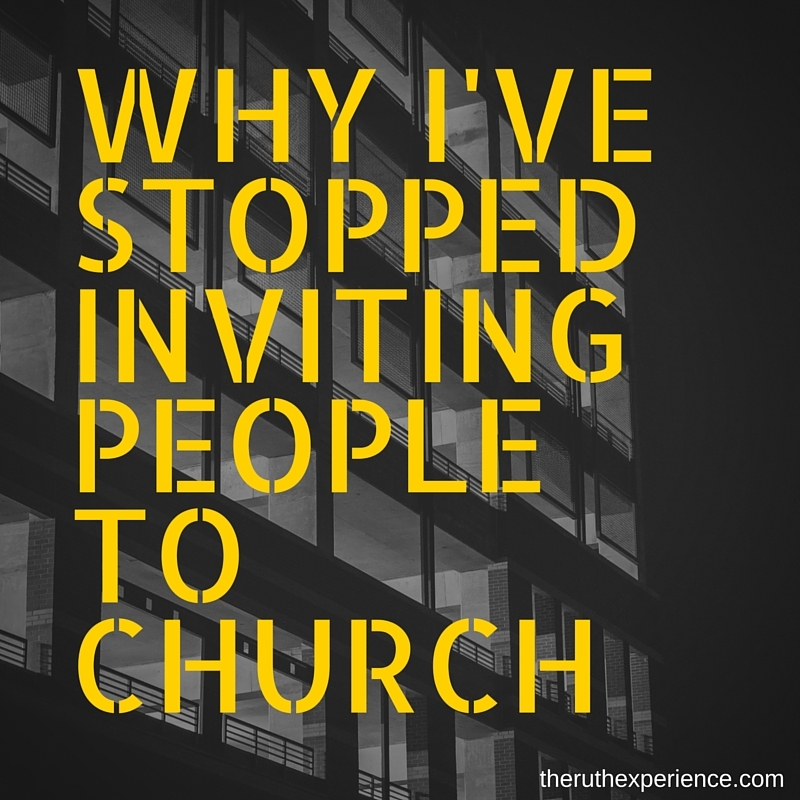 Because as much as I love the church setting, there are people who will never darken the door of our local churches and we have to be willing to meet them were they are at, where they are most comfortable. We have to be able to see that church can happen anywhere—living rooms, coffee houses, even the local bar. Are we willing to be people who offer others community outside of these walls we call “church”? Or will we walk away from people who have said no to our offerings to come to a service, all while thinking we’ve done our part to share the Gospel? As if a refusal to attend a church service somehow equates to a rejection of God. These are the ponderings I’ve wrestled with (and still do). I believe we need to be people who walk with others through their everyday lives, because God is in those spaces too. Emmanuel, God with us. Not just a building, but in our homes. In our schools and places of work, our neighborhoods and communities. Being able—and willing—to see the sacred spaces we can create in the everyday experiences of our lives, if only we will open our eyes to them. 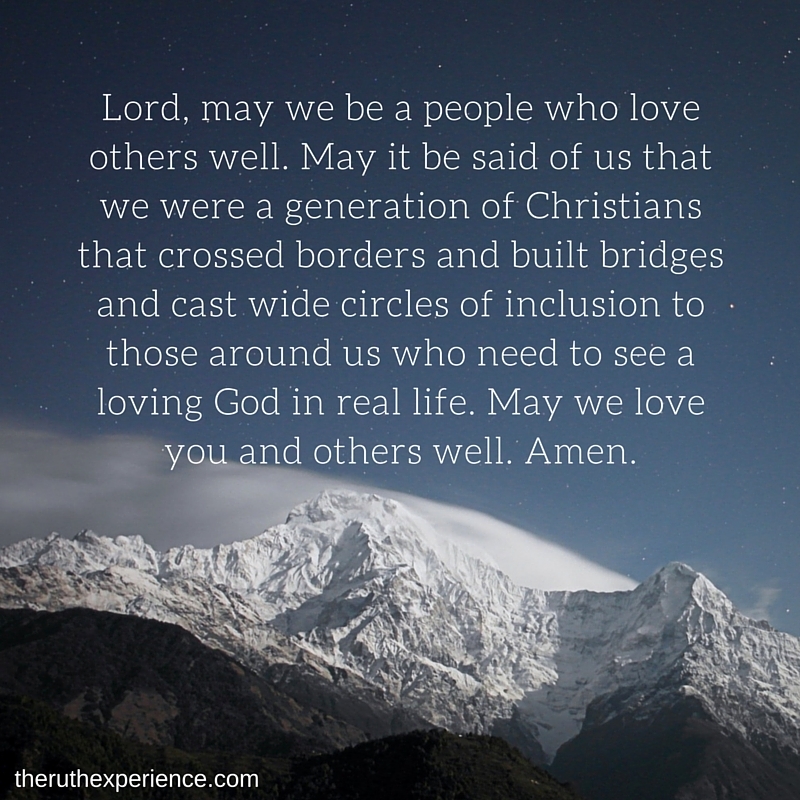 Lord, may we be a people who love others well. May it be said of us that we were a generation of Christians that crossed borders and built bridges and cast wide circles of inclusion to those around us who need to see a loving God in real life. May we love you and others well. Amen. I was drawn to your title at #TellHisStory and so glad I visited! This is such a very important post..with such vital information and wisdom. 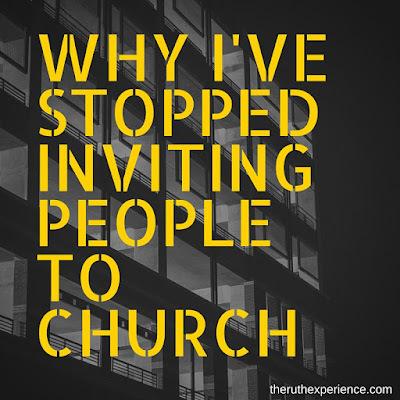 I don't invite people to church for all the reasons you shared. I became a Christian 7 years ago..and was shocked and still am shocked by some of the judgements that go on within the church about non-believers..it's hurt and continues to hurt.. I have found I'm worshipping more in 'spirit and truth' now..and sharing Christ in everyday ways. Thank you for your wonderful post! Kendra, I love this so much! Honestly - we spent many years outside of an organized church - in a building... but all the while, we are Kingdom people and we were the Church wherever we went. We gathered in homes and in coffeeshops, one on one or in a small group... and we scattered through out our city, trying to remember that church is us... and we get the honor of bringing it out in our every day lives! Imagine our shock when God called us to start a... wait for it... church? Ugh... But since my first reaction wasn't something expected -like oh @#** no! - we figured we'd better pray into it! We are entering our 6th month and our heart is to equip the body to live church outside! We want to break out of the system and do things differently and I love how you have found the freedom to do just that - and that it is bringing freedom to your community all around you! I remember talking with a friend who was saying while in Africa they did church similar to this... each week would be a 'theme' - one Sunday they would come and just worship. The whole time. And then be done! One week there would be teaching. One week something else... but one Sunday a month they would not meet at all and instead, open their homes and hearts to their actual real life neighbors! ;) Imagine! Karrilee, Thank you so much for all your words of encouragement! I could just HUG you right now! How exciting to start a church community that is living outside the walls labeled "church"! This blessed me. Many blessings as you continue to lead others well. GREAT post. There is so much out there about how in this era people don't need church and or don't like church that are just depressing. In this post you gave value for why people might feel this way, but really drove home the point that church is really about a community of faith, and that is something that exists far beyond the church building! Very refreshing. Thank you so much Kelsey! You summarized perfectly what I was trying to convey in this post! Blessings! I just sent your post to our pastor. I know his heart is for our community. So much goes on to keep a church going, we can forget the people who who need to be loved in our neighborhoods. I think what you're doing takes more courage and risk. It's easier for me to invite someone to church - and "let other people do their thing" to draw them to God. It works both ways, however, and people are coming and staying. I just wish so many more would. I agree Sue. I would love for more people to come to our churches. It's true, I find that (like many things) waiting on God's timing and allowing him to work in people's lives takes a lot longer than I would like! Thanks for your wise words.